Dexter Daily: POLL: What Did You Think of Edward James Olmos' Role As Professor Gellar in Season 6? POLL: What Did You Think of Edward James Olmos' Role As Professor Gellar in Season 6? What did you think of Edward James Olmos role as Professor James Gellar in the sixth season of the show? Olmos' role as Gellar was first announced on May 2011 as "a brilliant, charismatic professor of religious studies". Was he as good as you expected? Vote below and tell us your opinion in the comment section! 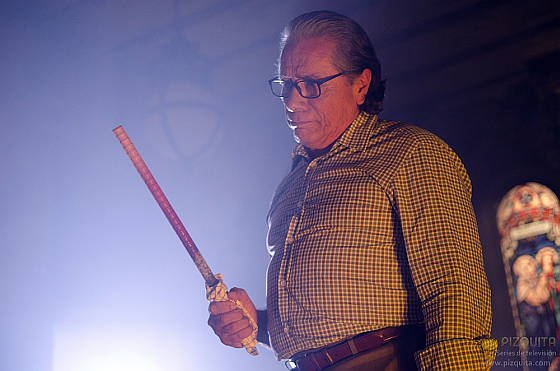 What did you think of Edward James Olmos' role as Professor Gellar in Season 6? criminally no confrontation or even airtime with mch and ejo together, which is what i was excited about when first announced. i would have liked them both to have discussed philosophies on life and it would have changed Dex's outlook somehow? obviously the writers had other plans, but overall a dissapointment to be honest. The point was not gimmicks or getting "screen time" the point was telling the story to explain Dexter's own struggle, and foreshadowing how far Dexter might fall if he does not form a connection but relies only on his visions of Harry. We see that Travis's visions ultimately forced him to reject his humanity and push himself down the path to complete damnation. The character was meant to show us Harry's ghost in a "different light" in an unsympathetic light. He trusted the ghost over his own sister who loved him, and killed his sister on the word of this mentor ghost. Just like Harry's ghost has often asked Dexter to shirk his humanity and his connections, warning him about this and that, and then nodding sadly when these seeming prophecies seem to become fulfilled. What do you suppose this represents in psychological terms? Many people say that this is all "Freudian" but I have always had the notion that Dexter is distinctly "Jungian" in it's mythology, hence the religious symbolism. How many times has the show focused on the scar in Dexter's side and then focused on the wound on every crucifix that shows up in the series. Several times... in fact. How did Dexter get that scar? He gave in to his humanity and performed a selfless act for Deb to make her happy because SHE is the first person he ever learned to love (even though he didn't realize it). He fell onto a fence and was impaled and nearly died as a result of his BLOOD "being rare" - this was also the episode where the writers specifically showed us that Deb and Dex are NOT blood. This wound is also foreshadowing something else that he will do down the line, again for Debra, it's forecasting his martyrdom and ultimate act of love for her, hence we always see the crucifix reference again and again. This show is written in symbolism, it is not written in linear plot points. EJO's character was symbolic of something else. This is beautiful metaphor, stop asking them to dumb down the show for the sake of the smaller portion of the audience that doesn't GET IT. EJO served his purpose - did exactly what that character was supposed to do, which was to call attention to the fact that the audience is often to trusting of the advice of Harry's ghost. We are so sympathetic to the image of Harry, that we often forget just how wrong the specter of dear old dad IS. He only keeps Dexter from going over the deep end, he does not actually serve Dexter's best interests. Notice how EJO's ghost made Travis adhere to a kind of "code" also (his religious code) but once the ghost was completely removed, Travis went bonkers, sorta like Dexter did when Brian showed up. This reminds us that while the Harry's advice is better than the alternative, it is still not *right*.